Mr. Trump’s immigration policies could transform California’s Central Valley, a stretch of lowlands that extends from Redding to Bakersfield. 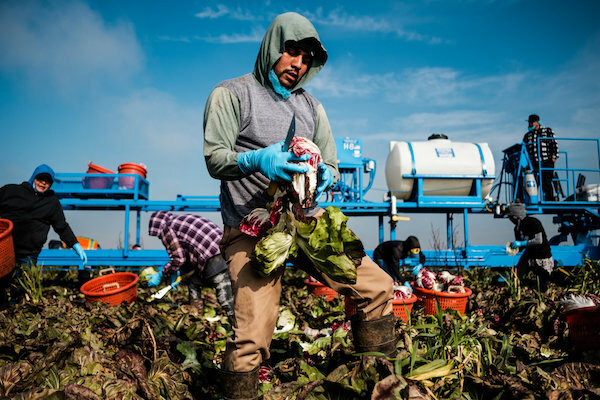 Approximately 70 percent of all farmworkers here are living in the United States illegally, according to researchers at University of California, Davis. The impact could reverberate throughout the valley’s precarious economy, where agriculture is by far the largest industry. With 6.5 million people living in the valley, the fields in this state bring in $35 billion a year and provide more of the nation’s food than any other state. The consequences of a smaller immigrant work force would ripple not just through the orchards and dairies, but also to locally owned businesses, restaurants, schools and even seemingly unrelated industries, like the insurance market. Many here feel vindicated by the election, and signs declaring “Vote to make America great again” still dot the highways. But in conversations with nearly a dozen farmers, most of whom voted for Mr. Trump, each acknowledged that they relied on workers who provided false documents. And if the administration were to weed out illegal workers, farmers say their businesses would be crippled. Even Republican lawmakers from the region have supported plans that would give farmworkers a path to citizenship. Mr. McClarty is not just concerned about his business, but also about his work force, he said. Many of them have worked for him year-round for more than a decade, making at least $11 an hour. After immigration officials audited his employee records a few years ago, he was forced to let go of dozens of employees. Now he worries that a Trump administration could mandate a Homeland Security Department program called E-verify, which was aimed at stopping the use of fraudulent documents. In all but a few states, the program is voluntary and only a small fraction of businesses use it. Farmers here have faced a persistent labor shortage for years, in part because of increased policing at the border and the rising prices charged by smugglers who help people sneak across. The once-steady stream of people coming from rural towns in southern Mexico has nearly stopped entirely. The existing field workers are aging, and many of their children find higher-paying jobs outside agriculture. Many growers here and across the country are hopeful that the new administration will expand and simplify H-2A visas, which allow them to bring in temporary workers from other countries for agricultural jobs. California farmers have increasingly come to rely on the program in the last few years. But Mr. McClarty and others say that legalizing the existing work force should be the first priority. While they support the idea of deporting immigrants who have been convicted of serious crimes, they oppose forcing people to leave the country for minor crimes, like driving without a license. Since the election, they have continued to call their congressional representatives and lobbied through trade associations, like the Western Growers Association, whose chief executive is part of Mr. Trump’s agricultural advisory board. Farmers are also anxiously awaiting the administration’s plans to alter longstanding trade agreements. Mr. Trump has said he will pull out of the North American Free Trade Agreement if he cannot negotiate better terms for the United States. Growers would benefit if Mr. Trump negotiated more favorable terms. But backing out of the agreement entirely could provoke retaliation from Mexico that would hurt California’s agricultural industry, which earned $21 billion from trade last year. Yet, many of Mr. Trump’s supporters say they are counting on him to follow through on his promises. Dan Stein, president of the Federation for American Immigration Reform, said that limiting the use of foreign labor would push more Americans into jobs that had primarily been performed by immigrants. The prospect has business owners in the valley on edge. Patricia Pantoj runs a travel agency in Madera, north of Fresno, where the city’s approximately 60,000 residents are predominantly Latino and work in the fields. This year, she said, fewer people than ever before traveled back to their hometowns in Mexico. A few doors away from the travel agency, Maria Valero said all the customers at her gift shop were undocumented. “If they went away, I would be out of business tomorrow,” she said. Jhovani Segura, an insurance agent in Firebaugh, near the southern end of the valley, said that as much as 80 percent of their new car insurance policies came from undocumented immigrants who, under a new state law, became eligible for driver’s licenses in 2015. “If there were mass deportations, we would have to cancel half of our policies,” he said. In Ceres, north of Merced, the public school district is the largest employer by a large number, and many of the jobs were created to support the children of immigrants. Administrators say any crackdown would result in huge job losses and would reduce funding, which is distributed by the state based on need, for all the children in the district. Most of the workers in Mr. McClarty’s vineyards and orchards have well-established lives in the area. Javier Soto, 46, bought a home for his family of five in Reedley, a city of 25,000 that calls itself “the world’s fruit basket.” He has worked for Mr. McClarty’s farm for the last six years and his supervisor knows he is here without papers. “It is more scary now that he is really the president and we see what he is doing,” Mr. Soto said. They are hopeful Mr. Trump will not make good on most of his threats. “Quien más habla, menos hace,” they tell each other — the more you talk, the less you do. There are too many of them, they reason, to throw them all out. Mr. Marchini, the radicchio farmer, said he felt similarly after seeing generations of workers on his family farm send their children to college and join the middle class. Mr. Marchini’s family has farmed in the valley for four generations and he grew up working side by side with Mexican immigrants. He said that no feasible increase in wages or change in conditions would be enough to draw native-born Americans back into the fields. Less than a month after his presidential win, Trump’s populist appeal has started to clash with a Cabinet of billionaires and millionaires that he believes can energize economic growth. When asked Wednesday about his credentials to be Treasury secretary, Mnuchin emphasized his time running OneWest — which not only foreclosed on Colebrook but also on thousands of others in the aftermath of the housing crisis caused by subprime mortgages. The Trump transition team has been sensitive to preserving trust with its voters. Senior adviser Kellyanne Conway publicly warned that supporters would feel “betrayed” if former critic Mitt Romney was named secretary of state, for instance. For Mnuchin, the fundamental problem stems from the Great Recession. His investor group was the sole bidder to take control of the troubled bank IndyMac in 2009. The group struck a deal that left the Federal Deposit Insurance Corporation responsible for taking as much as 80 percent of the losses on former IndyMac assets and rebranded the troubled bank as OneWest. The combination of OneWest’s profitability, government guarantees and foreclosure activities drew the ire of activist groups like the California Reinvestment Coalition. It found the bank to be consistently one of the most difficult to work out loan modifications with even though OneWest never drew a major response from government regulators. Colebrook said she learned the hard way about OneWest’s tactics, after the regional bank acquired her home lender, First Federal Bank of California, in late 2009. By the time the financial crisis struck in 2008, she had an interest-only mortgage on the triplex known as a “pick-a-payment” loan. Her monthly payments ran as high as $2,000 and only covered the interest on the debt. Then she got ensnarled in the economic downturn. Over five years, she tried unsuccessfully to adjust her loan with OneWest through the Treasury Department’s Home Affordable Modification Program. But she said that One West Bank lost paperwork, provided conflicting statements about ownership of the loan and fees and submitted charges that were unverified and caused her loan balance to balloon. By the time she lost her home in foreclosure in April 2015, the payoff balance totaled $517,662. Last year, Kraig Moss sold the equipment for his construction business in upstate New York and stopped making mortgage payments so he could follow Donald Trump on the campaign trail. 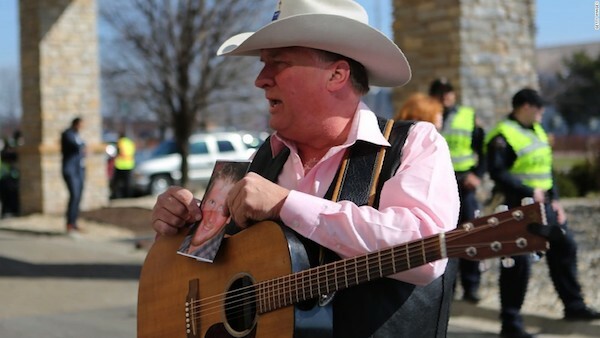 The amateur country crooner sang pro-Trump ditties while strumming a guitar emblazoned with Trump campaign stickers, earning him the moniker "Trump Troubadour." International media dubbed him "the voice of unheard America." But now, Moss refuses to play the guitar with the Trump decorations. He's soured on the President because of the newly proposed Republican health care bill. That legislation, which the president supports, could result in dramatic cuts in addiction treatment services. Three years ago, Moss found his son, Rob, dead in his bed from a heroin overdose. He was 24. "The bill is an absolute betrayal of what Trump represented on the campaign trail," he said. "I feel betrayed." Last year, at a campaign rally in Iowa, Trump reached out and spoke directly to Moss about Rob's death. "In all fairness to your son, it's a tough thing. Some very, very strong people have not been able to get off (heroin)," Trump called out to Moss in the crowd. "The biggest thing we can do in honor of your son ... we have to be able to stop it." When Moss became emotional, Trump comforted him. "I know what you went through. And he's a great father. I can see it. And your son is proud of you. Your son is proud of you," Trump said. "I'll bet he was a great boy." Kraig Moss, a supporter of Donald Trump during the campaign, sings a song outside a truck with a Trump painting last year in Iowa. Now, he regrets doing so. Several times on the campaign trail, Trump vowed to increase services for people facing addiction. "We will help all of those people so seriously addicted. We'll get them assistance," he told the crowd at a campaign event in New Hampshire in October. "I truly believe from the heart that (Trump) is going to do everything he can. He's going to create treatment centers for the kids," he said last year. But last week, Moss read about the proposed American Health Care Act. The Republican bill would end the Obamacare requirement that addiction services and mental health treatment be covered under Medicaid in the 31 states that expanded the health care program -- which include Moss' home state of New York. "This bill would devastate efforts to address the opioid crisis," said Dr. Joshua Sharfstein, director of the Bloomberg American Health Initiative at Johns Hopkins Bloomberg School of Public Health. "There's no question this legislation in the House of Representatives would cost American lives." At a CNN town hall event last week, Health and Human Services Secretary Tom Price was asked about the bill's provisions for opioid treatment. He responded that state governors had "wonderful ideas about how to address it" but that they felt "hamstrung by the federal government." "There are wonderful ways if we keep the focus on the patient -- not the government, but on the patient," he said. Moss looks back on his days on the campaign trail, on how he sold his trucks to finance the trip, how he sang his heart out and went from restaurant to restaurant to hand out "Donald Trump for President" CDs. Kraig Moss, once dubbed "Trump Troubadour," now feels betrayed by the candidate over the proposed health care bill. "I did a lot to promote his candidacy," he said. "Now, I wish I had never sold my equipment." But he doesn't like to think about regrets. He's looking to the future. Earlier this month, more than 300 people showed up in 6-degree weather for a fundraiser Moss organized in his son's memory. He raised $3,000 for a local drug treatment center, but he said the greatest gift of the evening was that people who'd lost loved ones to drug addiction came together and comforted one another. "We all felt less alone," he said. 4. Indiana woman thought Trump would deport 'bad hombres.' Instead, he's deporting her law-abiding husband. 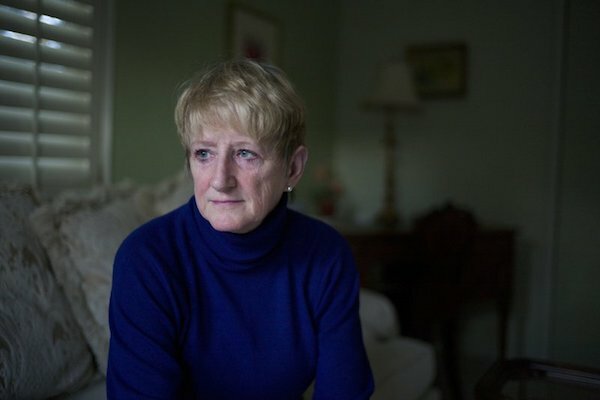 When Helen Beristain told her husband she was voting for Donald Trump last year, he warned her that the Republican nominee planned to "get rid of the Mexicans." Defending her vote, Beristain quoted Trump directly, noting that the tough-talking Republican said he would kick only the "bad hombres" out of the country, according to the South Bend Tribune. 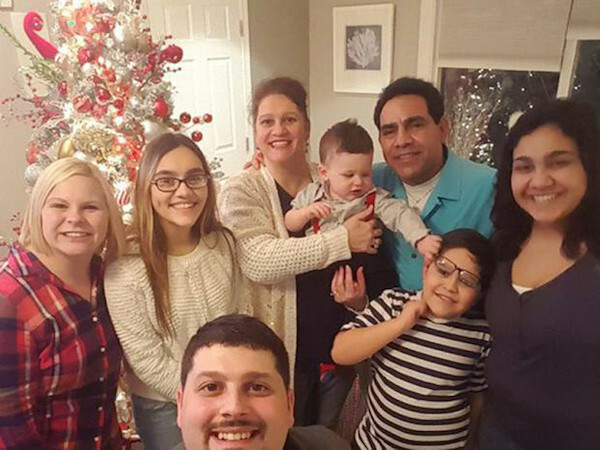 Months later, Roberto Beristain — a successful businessman, respected member of his Indiana town and the father of three American-born children — languishes in a detention facility with hardened criminals as he awaits his deportation back to Mexico, the country he left in 1998. "I wish I didn't vote at all," Helen Beristain told the Tribune. "I did it for the economy. We needed a change." Critics on the left have blasted Helen Beristain for not taking the president's rhetoric seriously and allowing his administration to plunge the country into what they consider a chaotic and inhumane immigration debacle. Critics on the right have inundated the family with racist threats and attacked Beristain for giving refuge to the love of her life, a man they consider a foreign interloper. Caught somewhere in the middle of the fiery political clash are people like Roberto Beristain — individuals who have built a successful life inside the confines of the fuzzy, legal limbo in which they exist. Supporters say the 43-year-old has never broken the law and doesn't have so much as a parking ticket on his record. The mayor of South Bend, Ind., the conservative community the Beristains call home, called him "one of its model residents." But Beristain's model citizenship didn't stop Immigration and Customs Enforcement officials from arresting him when he showed up for his annual meeting with the agency on Feb. 6. Beristain — who had obtained a Social Security card, a work permit and a driver's license — was expecting to return home to his family and business. Instead, he was taken into custody, setting off a last-ditch effort by family members and multiple lawyers to free him from ICE custody. Thus far, those efforts have failed. Family members told the Tribune that ICE officials had informed them that Beristain would be deported Friday. Beristain has been in the United States since 1998, when he visited an aunt in California and decided not to return to Mexico, according to the Tribune. He would go on to marry his wife, start a family and put down roots in Indiana, where he is the owner of a popular restaurant called Eddie's Steak Shed, which employs 20 American citizens, advocates told The Washington Post. He has worked at the restaurant for the past eight years and bought it from his sister-in-law in January. In 2000, the ICE spokeswoman said, a federal immigration judge granted him "voluntary departure" for a 60-day period. Because he didn't leave the United States during that 60-day period, Beristain's "voluntary departure order reverted to a final order of removal," the spokeswoman said. And yet, by cooperating with ICE officials, Beristain was able to lead a normal life in plain view, one that included a work permit and a driver's license. He even has a Social Security number that says "Valid only with Department of Homeland Security authorization," the Tribune reported. Jason Flora, an Indianapolis lawyer who has worked on Beristain's case, said that, under his previous agreement with DHS, Beristain had an "order of supervision," which allows immigrants with a removal order to remain in the country for a humanitarian reason, such as having sole custody of children or taking care of family members. "Essentially," Flora said, "they're saying you're not bad enough to be deported." Reached by phone Friday afternoon, the family's spokesman, Chicago lawyer Adam Ansari, told The Post that ICE officials had told him that Beristain would be moved from his current location inside a county jail in Kenosha, Wis., to New Orleans, where he'll be held another two weeks before being deported to Mexico. The situation is always fluid and accurate information is often hard to come by, Ansari said. What was clear, he said, was that the entire process since Beristain's arrest had been "inhumane" and that the Beristain family is "distraught." "How do you explain this to children," he said, noting that Beristain's children are 15, 14 and 8 years old. "Trying to explain this to children from the immigrant community has been really hard. You're telling them that their loved one is in jail not because they did something wrong, but because of their country of origin and what they look like. "This is hurting the entire community and people are scared," he added. Reached by email, an ICE spokeswoman said Beristain "remains in ICE custody pending his removal to Mexico." "For operational security reasons, ICE does not release information regarding upcoming removals," she added. Stories such as Beristain's — in which law-abiding parents are deported because of their immigration status — have inundated the news media in recent months. The Twitter account "Trump Regrets" has amassed nearly 260,000 followers by retweeting disappointed and angry Trump voters. "Previously," as The Washington Post's Samantha Schmidt and Sarah Larimer reported last month, "the Obama administration prioritized the deportation of people who were violent offenders or had ties to criminal gangs. Trump's executive order on Jan. 25 expanded priorities to include any undocumented immigrants who had been convicted of a criminal offense." "Personally, I think the president should be giving him a handshake," said Flora, the lawyer who had worked with Beristain. "Either Trump was lying when he said we were only deporting bad guys or Trump's view of bad guys is so expansive it can literally include every single immigrant." Days after Beristain's arrest, Flora said, he filed a "stay of removal" to prevent deportation, but it was rejected March 15. "Once the case is finalized and done, there's really no reason to keep him around in their eyes," Flora said, referring to ICE. "They think, 'Why take up jail space for no reason if all the legal options have been exhausted?'" Flora said the decision to deport Beristain is a "wildly disproportionate" response when measured against the law he broke nearly two decades ago. "If you asked 100 people to paint you a picture of a bad guy, no one would draw anyone remotely resembling Roberto," he said. Helen Beristain told the Tribune that — in their effort to get her husband U.S. citizenship — the couple has had 10 attorneys over the past 18 years. Many of those attorneys, she said, told them that they had no choice but to wait for immigration laws to change. Instead of changing in the couple's favor, the laws evolved to make her husband more vulnerable to deportation, a development the Beristains never expected. She told the Tribune that Trump's deportation measures — the ones she thought her family would be exempt from — are harming "regular people." "I understand when you're a criminal and you do bad things, you shouldn't be in the country," Helen Beristain told the CBS TV affiliate WSBT. "But when you're a good citizen and you support and you help and you pay taxes and you give jobs to people, you should be able to stay." "We were for Mr. Trump," she added. "We were very happy he became the president. Whatever he says, he is right. But, like he said, the good people have a chance to become citizens of the United States." An undocumented immigrant whose arrest pushed an Illinois town into the center of the national immigration debate has been freed from a detention center. Juan Carlos Hernandez Pacheco was released Wednesday on $3,000 bond. 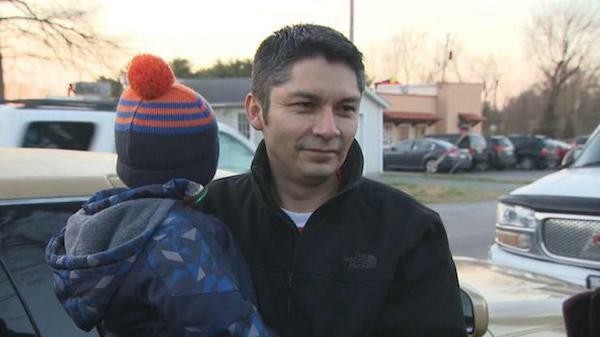 Immigration agents took him into custody last month. His detention led to an outcry from residents and elected officials – many of them supporters of President Trump – in West Frankfort. The president won the county with more than 70 percent of the vote. About 8,000 people live in West Frankfort, and judging by the response, many of them know Hernandez. They say he’s an important member of the community, reports CBS News correspondent Anna Werner. The question is: Will he be allowed to stay? The community raised money to bring their friend home in style to his family after nearly three weeks in detention. He’s an undocumented immigrant they claim as one of their own. “First of all, I think I need to be grateful,” Hernandez said, hours after his release. “For all of the support,” Hernandez responded. Tim Grigsby and Mark Williams are his friends. They said they’ve known him for more than 10 years. Hernandez has lived in southern Illinois for nearly 20 years. On February 9, immigration officers arrested him at his home. They were looking for someone else, but found he was here illegally. “Did you ask him why?” Werner asked. “For my previous record,” Hernandez said. In a statement, ICE pointed to Hernandez’ two convictions for DUI in 2007. He’s now sober. But under the previous administration, experts said those misdemeanor offenses likely would not have gotten him picked up. People in West Frankfort, many of whom came to greet him Wednesday night at the restaurant he managed, wrote letters of support to the mayor, police officials, and people he’s helped with fundraisers and donations. Under Trump administration directives, experts said he’s also now the type of person who may be deported. “When Mr. Trump talked about deporting more people, who did you think he was going to deport?” Werner asked Hernandez’s friends. Hernandez himself said he doesn’t blame the president. “He’s protecting your family? Even despite what just happened to you, you think that?” Werner asked. “But it has nothing to do with him. I don’t believe that. I don’t believe that he focused on me. I’m not a target. I don’t feel that way,” Hernandez said. For now, he’s out on bond while his application to stay works its way through the immigration system. His lawyer told us he is hopeful that Hernandez will have a good chance because his wife is a U.S. citizen, as are his children. In just the first two months of his presidency, Donald Trump has gotten off to a tumultuous start — and things only seem to be going further downhill. His policies thus far, including his controversial travel ban, have ruffled feathers among Republicans and Democrats alike. The drama continued this week as Trump offered his support for the House Republican’s proposed health care bill to replace the Affordable Care Act (ACA), which is shaping up to leave many Americans worse off. Even Trump’s own supporters are beginning to feel duped by his false promises to replace “Obamacare” with something better. ABC News interviewed North Carolina Trump supporter Martha Brawley, 55, who said she voted for the very first time in her life for him and now regrets it. Just as many Americans feared, older Americans and low-income families will be thrown to the wayside, so to speak, under the Republicans’ proposed bill, which is causing anger, fear, and anxiety throughout the nation. 7. 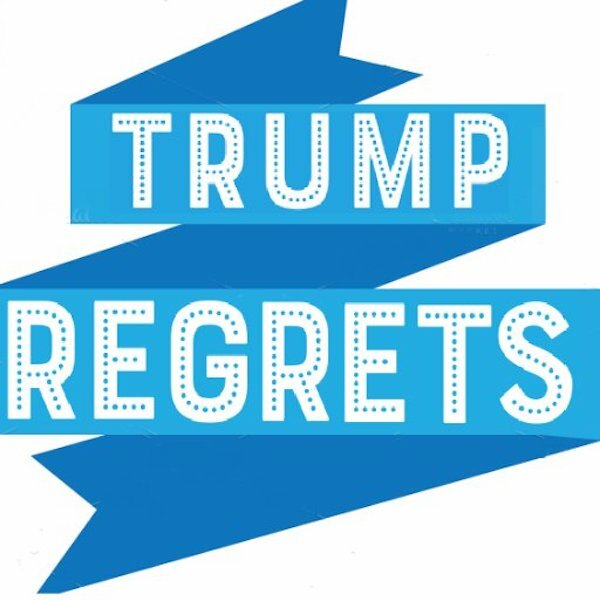 A Twitter account called Trump Regrets is documenting the tweets of people who said they voted for Trump and now wish they hadn't. Prepare to feel a confluence of emotions. 8. 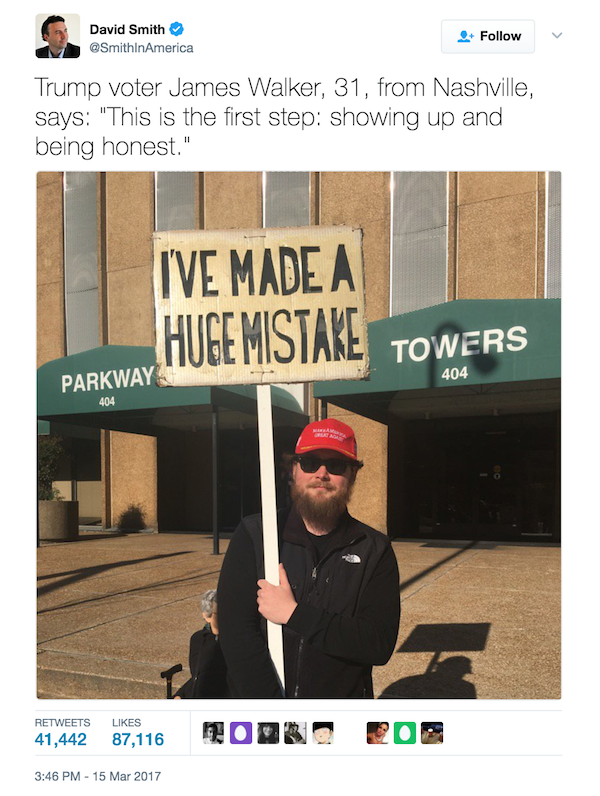 This former Trump supporter did what the President has never done. Admit he was wrong. Donald Trump held a rally on 15 March in Nashville Tennessee, during which he vowed to challenge the travel ban block at the Supreme Court, should he need to. A judge has just blocked our executive order on travel and refugees coming into our country from certain countries. The order he blocked was a watered-down version of the first order that was also blocked by another judge and that should never have been blocked to start with. This is, in the opinion of many, an unprecedented judicial overreach. Up to half-a-dozen states are seeking to block the executive order and judges in Maryland and the state of Washington also heard cases. What may be more interesting to some, is what was happening outside the rally. 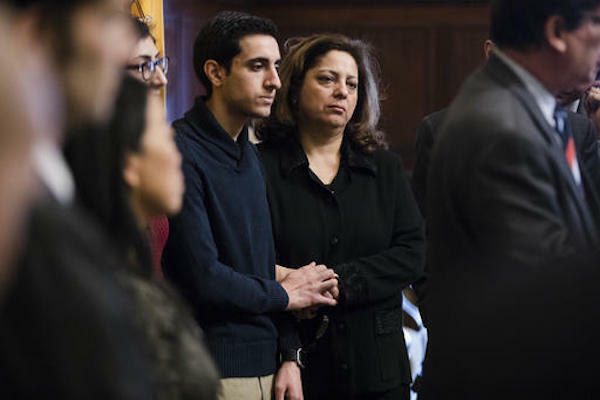 Two Syrian families with Allentown ties are suing President Donald Trump and his administration, seeking to return to the United States after they were deported Saturday from Philadelphia. The suit on behalf of six members of the Assali family was set to be filed Tuesday morning in the U.S. District Court for the Eastern District. Other lawsuits have been filed over Trump's executive order establishing a temporary ban on immigration from seven predominately Muslim countries, with Washington state being the first state to file on Monday. The Assali family members are represented by the American Immigration Lawyers Association, the American Civil Liberties Union of Pennsylvania and attorneys from Kairys, Rudovsky, Messing and Feinberg. "This is not the end to the lawsuits being filed," Molly Tack-Hooper, with the ACLU of Pennsylvania, said at a news conference in Philadelphia. Ghassan and Sarmad Assali, who live in Allentown, have worked since 2003 to bring over Ghassan's brothers, their wives and two children. The family members, who are Christian immigrants from Damascus, had approved visas. On Friday night, Trump signed an executive order restricting travel from seven Muslim countries. When the families landed Saturday morning in Philadelphia International Airport, they were blocked and then sent back to Qatar. "I know this country was built on immigrants," said Sarmad Assali, who emigrated in 1978. She spoke of her brother, who served in the Army for 21 years. Sarmad Assali called the order "unAmerican," and that her brothers-in-law and their families were not allowed to call anyone, and were not given access to an attorney or a translator. "How they sent them back so quickly was heart-breaking," Sarmad Assali said, adding that her younger brother-in-law became sick on the 18-hour flight back to Qatar. Joseph Assali, Sarmad's son, called the executive order an outrage. "We are an American people. If you go back far enough, we are an immigrant people," he said. After the current administration's first 100 days, "you need to think about what kind of America we will be living in." Joseph Assali said even though discrimination and racism have taken root, "I know the American people will stand with me." Jonathan Feinberg, an attorney with Kairys, Rudovsky, Messing and Feinberg, noted no one has been detained since Saturday at Philadelphia International Airport. He addressed the Monday night firing of acting Attorney General Sally Yates. "She defied the president by upholding the constitution and federal law. If that is the situation we are facing in federal court ... we will fight," Feinberg said. "It's our hope that we have the cooperation of the local attorney general's office." The family members paperwork was confiscated, and the suit seeks to have it reissued in 48 hours or less, as well as to have the family members returned to the United States. A hearing in federal court is expected in the next several days, Feinberg said. 10. Trump Supporter Who Uses “Meals On Wheels” Is SHOCKED That Donald Trump Would Hurt Her! 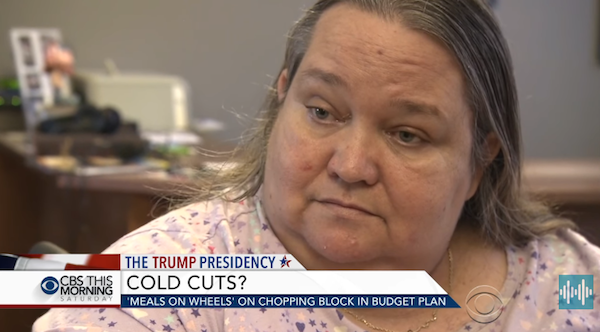 Donald Trump is proposing drastic budget cuts, and one victim is the “Meals On Wheels” program, which delivers meals to the elderly and others who may be homebound. Meals on Wheels is a critical lifeline for 2.4 million seniors, veterans and the disabled. A third of its $1.4 billion budget comes from the federal government, but proposed budget cuts are putting the 43-year-old program at risk. “We can’t spend money on programs just because they sound good… to take the federal money and give it to the states and say, ‘Look we want to give you money for programs that don’t work,’” White House budget director Mick Mulvaney said. Remember, Meals On Wheels just doesn’t provide food. The volunteers are a vital lifeline for people who may not have anyone else to check up on them. One person who benefits from Meals On Wheels is 56-year-old Linda Preast, who signed up for the program two years ago after a stroke left her in a wheelchair. Meals on Wheels delivers to her every weekday. 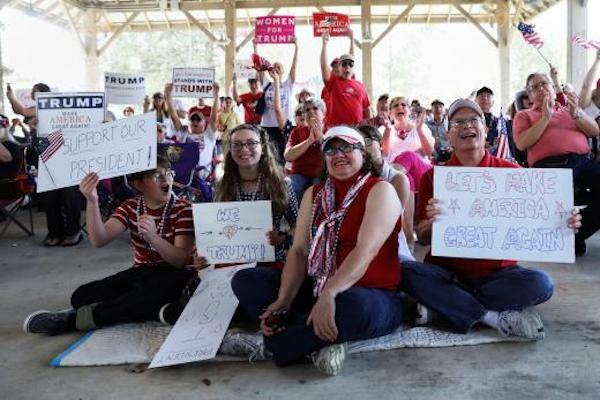 Like most residents in Jones County, Georgia, she voted for Donald Trump. “Are you surprised?” Miller asked. “What would you say to him to convince him not to cut this program?” CBS News correspondent Michelle Miller asked. “What if it was your momma?” Preast said. After the president’s budget proposal was released, Meals on Wheels reportedly received a surge of donations and offers to volunteer. 0 Response to "10 Sad Story of Trump Supporters"